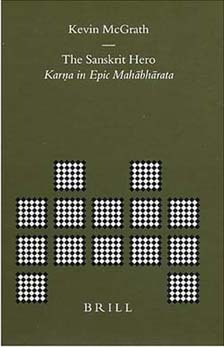 In this fascinating work, McGrath seeks to study how Karna has been portrayed as a heroic-Aryan ideal from both archaic and classical viewpoints in the Mahabharata and attempts to illustrate how the typology still obtains in modern society, as evinced in Tagore’s poem on Karna and Kunti composed in response to scientist Jagadish Chandra Bose’s request to adopt Karna as mythic paradigm for the modern Indian, and in songs about Karna in Gujarat celebrating him as a hero who brings water and fertility to the community. Even in Indian cinema, the tragic figure of Karna has a perennial appeal, his story being woven into various film scripts in modern guise. The occidental indologist’s interest in Karna and the tendency to look upon him as the epic hero is understandable because he displays quite a few resemblances to Achilles, the hero of the Iliad. Both have special, divinely crafted armour; both have a celestial parent; both sulk and stand aside from the battle initially out of wounded amour proper; both are ultimately struck down by archers. Adopting Blackburn’s paradigm of epic aetiology in contemporary India as developed by Gregory Nagy where the epic is seen as evolving from ‘uneven weighting’ towards ‘even weighting’, McGrath finds Karna’s epic being subsumed under the weightier Arjuna-epic in the written tradition. Underlying their confrontation is an ancient Vedic substratum: the antagonism between Surya and Indra pointed out by Georges Dumezil (Indra detaches Surya’s chariot wheel; Surya’s natural mother abandons him and the adoptive mother brings him up). McGrath does not notice that in the Ramayana the same rivalry is perpetuated through Bali and Sugriva, the sons of Indra and Surya respectively, the situation being reversed. 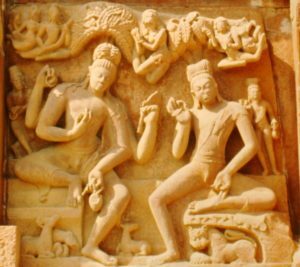 It is Surya-Sugriva who has Indra-Bali slain by Vishnu-Rama while, usually, Vishnu helps Indra to slay his adversaries through a trick. This issue warrants deeper examination. A good point made is that we never find out how the name of Karna is given. Adhiratha and Radha name him Vasushena and appropriately he is indiscriminately liberal like the Sun. In a footnote, McGrath makes an important point that deserved exploration in the book: the only other ‘ear-ringed’ heroes are Skanda, and the Maruts. Indra makes the one general of the celestial host against the Titans and has the others as his assistants after an abortive attempt to destroy them in the womb. While in exile, Bhima refers to the enemies being led by Karna as a helmsman steering the Dhartarashtra boat across the raging sea of battle. In the same passage Skanda is celebrated as a great donor. Both unhesitatingly gift Indra what he craves. McGrath does not, however, investigate why Karna becomes infused with the demon Naraka following Duryodhana’s capture by the Gandharvas. In the 18th century Tullal songs of Kerala he is the demon Sashrakavacha (thousand-armoured) reincarnated. No Indo-European hero has this demonic aspect. Yet, at the end of epic, Karna is very much a solar hero, celebrated by Kunti as ‘A hero, ear-ringed, armoured, splendid like the Sun’, seen by Yudhishthira as attended by twelve suns (dvadashaditya sahitam) and finally merging with the Sun (ravim). McGrath overlooks how Surya browbeats adolescent Kunti into submit to his sexual needs. It is a measure of her strength of character that even as an adolescent girl that she is able to stand up to him partially and obtain boons ensuring her impaired virginity and her son being special. In this, she parallels her grandmother-in-law Matsyagandha vis-‘-vis the importunate sage Parashara. In saying that Karna is seen in action first when he accompanies Duryodhana to count cattle in the forest, McGrath forgets the confrontation in Draupadi’ssvayamvara where he retreats, astonished at the ‘brahmin’ Arjuna’s bowmanship. Nor does he note that Karna’s much-vaunted prowess is decisively undercut here as also twice more in the cattle-counting and rustling episodes, which Bhishma, Drona and Kripa taunt him with. The contradiction between fidelity to Duryodhana as Karna’s declared paramount value and his refusal to fight so long as Bhishma is in the field, and later not taking Yudhishthira prisoner despite having him at his mercy, also remains unexplored. Karna’s fidelity to his word and to liberality for winning fame ‘ his pre-eminent concern ‘raise him to heroic levels that no other character reaches. Yet, Karna is far more mundane in his sufferings and conquests than Arjuna who destroys hosts of Daityas whom the gods cannot defeat, and duels with Shiva himself. Nor is Karna brutal and unfeeling like Bhima who does not even mourn Ghatotkacha and is quite demonic in his deeds. This humanity is what makes him more appealing as an epic hero and is the secret behind the numerous vernacular compositions celebrating him. Karna is defined by two crucial relationships: with Duryodhana it is one of inseparable confidante and advisor, paralleling that of Krishna with Arjuna; with Bhishma it is one of contention arising out of a curious similarity. The origin of both is linked to the heavens (Surya, Dyaus); both emerge out of the Ganga; both are Parashurama’s disciples; both are advisors of the Hastinapura court’Bhishma of the titular monarch and Karna of the actual ruler; both command the Kaurava army in turn and are regarded as the major hindrances to Pandava victory. McGrath isolates six crucial speeches Karna makes to Surya, Indra, Krishna, Kunti, Kripa and Shalya, concluding that his use of speech as a form of assault sets off the epic’s movement towards the battlefield. Dhritarashtra refers to Karna as one characterised by bitter speech while Yudhishthira speaks of him as ‘one whose teeth are spears and arrows and whose tongue is a sword’. McGrath identifies four levels in Karna’s persona where loss increasingly overwhelms him. In the interactions with Indra and Kripa he lacks nothing. In the speech to Krishna a sense of doom looms which he repeats when declaiming to Duryodhana on fate, for he is no longer invincible. Ultimately, shedding tears at his son’s death, he is vulnerable like Achilles weeping over Patroklos, and Ravana over Meghanada. His own death soon follows, for the epic hero needs must succumb to mortality to be celebrated eternally. Pradip Bhattacharya is the foremost Sanskrit scholar in India today in the field of Mahābhārata Studies. This present volume accomplishes a work of many year’s duration with a translation of the Mokṣa Dharma text of the Śānti parvan, spoken by Bhīṣma Śāṃtanava. In this task Bhattacharya is completing the work of P. Lal’s translation of the whole epic; Lal expired before finishing the work. who express the narrative; this great event of mimēsis is fully conveyed by the translation wherein Bhīṣma the poet enacts innumerable characters and voices. The prophets Nārada and Bhṛgu play significant roles in this section of the Great Bhārata as does Kṛṣna himself at times. There are also many episodes that are given in the style of faunal allegory where animal speech and behaviour are important components of communication. The great Naranārāyaṇīya, which comes at the end of the book is beautifully translated and finely captures the tone and flavour of that long anthem which lies at the heart of early Hinduism.